The release would be rolled out gradually, beginning with video-calling on Thursday, he said. Image caption Gilles de Kerchove refused to comment on the leaked document. He wrote: "The [European] Commission should be invited to explore rules obliging internet and telecommunications companies operating in the EU to provide, under certain conditions as set out in the relevant national laws and in full compliance with fundamental rights, access of the relevant national authorities to communications (ie share encryption keys)." Mr De Kerchove refused to comment on the leaked document. Earlier this month, Mr Cameron said he wanted internet firms to allow the government to view encrypted messages in order to aid the security services. But his plans to revive the Communications Data Bill, dubbed the "snoopers' charter", were criticised by civil liberties groups and the Deputy Prime Minister, Nick Clegg. 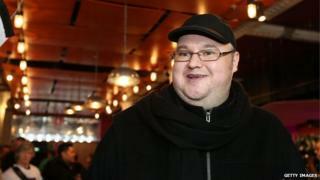 About three years ago, Mr Dotcom's Megaupload site was seized and he was arrested in an armed raid on his New Zealand house. Announcing the launch of MegaChat on Twitter, he noted the timeline that led from the raid to Thursday's announcement, highlighting the launch of his new site, Mega, and a political party in the subsequent years. And he wrote: "#Mega offers a security bounty again. Please report any security flaw to us. We'll fix it and reward you. Thanks for helping." Mr Dotcom still faces extradition from New Zealand to the United States on copyright infringement charges. In November last year, he said he was "broke" as a result of the consequent legal fight. He put the cost at $10m (£6.4m) since his arrest in 2012.